Due to high demand, there is currently a 2 1/2 - 3 week lead time on this pitching machine before it ships, no matter where you purchase it. •See the ball clearly from chute to pitch - great for timing! See our SITE-WIDE DISCOUNT by adding to Cart! Manufactured entirely in the U.S.A. for Rawlings by Spinball Sports, the Rawlings Pro Line 3 Pitching Machine is about as state of the art as pitching machines get. Pitch fastballs, curves, changeups, sliders, screwballs and even knuckleballs up to to 100 MPH with the Rawlings Pro Line 3 pitching machine without having to manually change wheel speeds or the angle of the wheels. 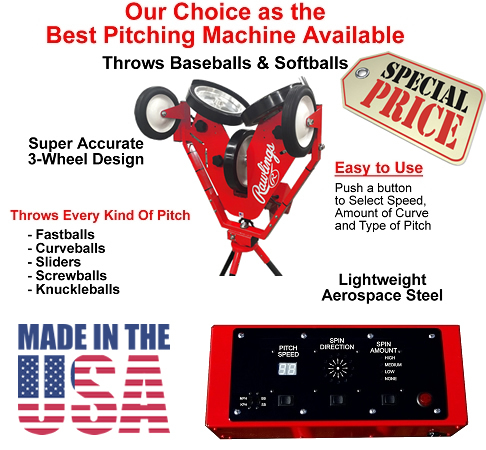 Choose from 12 different spin types, set the speed of the pitch and whether you want it to have a high, medium or low amount of spin (or none at all) and the pitching machine automatically adjusts the spin of the wheels to throw the pitch. A digital readout on the control panel allows you to set the exact pitch and speed, meaning you can switch between pitch types with precision. Pitch location is also super easy to control. Two different hand wheels allow you to set the vertical and horizontal location of the pitch. No more stopping to adjust clamps - just rotate the wheels up-down and/or left-right and you're set to pitch to a different plate location! The third wheel makes this revolutionary setup possible. It not only acts as a stabilizer but because its spin and speed is also controlled by the on-board computer chip, the head never needs to be moved. Better still, the three wheel design lets hitters see the ball all the way through the feeding motion until the pitch, which helps batters hone their timing. For the ultimate in convenience add a Rawlings Pro Line Automatic ball feeder so that you can practice solo! You can order one set of legs for either baseball or softball or both sets of legs for baseball AND softball. This machine also has the option of using XL legs instead of the standard 53 inch release point baseball legs. They have a pitch release point of 73 inches - the average release point of college and major league baseball pitchers. Engineered with aerospace grade steel, the Rawlings Pro Line 3 Wheel Pitching Machine is definitely the lightest 3 wheel pitching machine made. That being said it is still quite heavy, weighing 119 pounds. Fortunately, transport wheels are included with the machine so bringing it to a field is no sweat! Unlike pitching machines which use air filled tires, all Rawlings pitching machines use solid wheels with one inch thick urethane treads. Not only do they last longer than air filled tires, they pitch truer, always stay in balance and have a far shorter recovery time between pitches. Instead of having to wait 8 seconds between pitches like you do with other pitching machines, the Pro Line 3 Wheel Pitching Machine is ready for its next pitch in under 3 seconds. 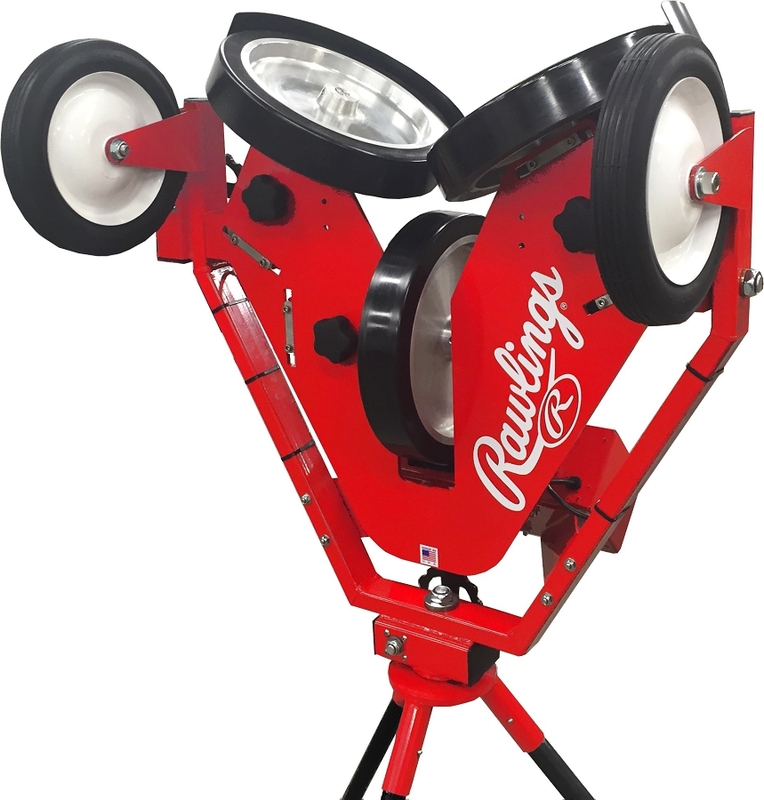 Our discount Rawlings Pro Line 3 Wheel Pitching Machine ships for free to the continental United States and is backed by an outstanding 5 Year Manufacturer's Warranty! It is powered by any standard 110 volt electrical outlet. Very impressed with this machine. I've used Jugs for years and decided to try something different because of the video. Glad I did. The easiest pitching machine I have ever used and super accurate - much more accurate than my Jugs machines. I love this pitching machine. I've used an ATEC and JUGS machine before and they don't come close to the ease of use of the Pro Line 3. It's also WAY more accurate than those machines. If you have the extra money, it's definitely worth it! The machine works great as a standalone machine. The feeder is a bit frustrating because sometimes it jams up and then you get two balls coming at you at once. I just bought some dimpled balls to use, but 9 inch baseball's are torn up pretty quickly. The accuracy is the tough part. Not sure if it's the balls or what, but it seems to have a mind of its own sometimes. I find it hard to believe the 99 out of 100 balls being accurate story. We've had a few bean balls already. All things considered though, I wouldn't send it back. It still does a great job! Pitching Machine Stop Reply: You may not have set the ramp at a high enough angle if balls are jamming. If your baseballs are being torn up that quickly, please make sure that you are only using the highest quality leather balls and that you have adjusted the wheel gap for real balls instead of pitching machine baseballs so that it is more accurate. Finally, please be sure to read our article about the accuracy of pitching machines, which mention how real balls need to be fed into a pitching machine to ensure better accuracy - How Accurate Are Pitching Machines? I bought this machine to replace the JUGS machine I had used for many years. I was happy with the JUGS machine but I wanted a machine with the capabilities of throwing several different pitches as my son is seeing better pitching as he gets older. The Rawlings Pro Line 3 Wheel Pitching Machine is everything I wanted in a pitching machine and more. It is very easy to use and my son is hitting everything now instead of just fastballs. The only reason I did not give this machine 5 stars is because it is heavy and not easy to move around. Although it comes with wheels so you can roll it around easily, it is very hard to stand it up. I wish it had handles for lifting it into position. Also, I was not able to use my JUGS dimple balls as they slipped in this machine so I bought some Baden and some MacGregor dimple balls which work great. Pitching Machine Stop Reply: Although JUGS Sports balls certainly are durable, they are also fairly slick, which makes it more difficult for hard tire wheels to grab the balls. That protective coating they put on their balls that make them last so long also is a detriment sometimes. Try scuffing the wheels of the pitching machine up a little bit with some fine sandpaper, which helps brand new wheels grip balls better. Also, try setting the wheel gap to be slightly more narrow with the JUGS balls and they might grab a little better. This is the third pitching machine I have purchased as a coach. I couldn't be happier. The easiest machine I have ever used. I purchased this machine a few weeks ago. I splurged to buy what I thought was the best machine on the market despite its high price. I have been very happy with the machine. It arrived in a box encased in foam. I doubt it could have been damaged if it had been dropped from the truck (which it wasn't). My son has used the machine himself and with his baseball friends virtually non-stop for the last few weeks. It throws every pitch at whatever speed you want (up to faster than MLB). We have used regular baseballs and it seems very accurate. I have fed balls a lot and it is very easy to use (one of the reasons I bought it). So far it has been an awesome machine and I have no regrets about buying such an expensive machine. Ordinarily I am pretty cheap and thought long and hard about spending so much for a pitching machine but have no buyer's remorse. It has been a great machine. If you can swing the cost I would highly recommend this machine. This is absolutely the best pitching machine on the market. We've had the machine for 2 weeks and all I can say is WOW! It will throw every pitch under the sun with extreme accuracy. The unit is heavy but once you get the wheels installed and are able to role it from place to place it isn't to bad. You will definitely want to have 2 people to lift it into a vehicle to transport it but aside from the weight factor I have no complaints. The workmanship is second to none and this thing is built to last. It is the M-1 Abrams of all pitching machines. Buy one now and don't look back, you won't be sorry! Q: I am in the market for a pitching machine that throws fast and throws multiple off speed pitches and breaking balls and that does not take a lot time to change pitches. I would like to throw a 90 mph fastball then throw a 70 mph change up in the next few seconds. Is this possible? I have read a lot of reviews and I think I have narrowed my choices down to ATEC M3, Rawlings Pro Line 3 and Hack Attack, which would be the best?. A: The main difference between the Rawlings Pro Line 3 Wheel pitching machine and the other two is ease of use. They all will throw any type of pitch and 2 out of the 3 will throw faster than almost any pitcher anyone is likely to face. With both the Hack Attack and the ATEC M3, you are going to have to manually adjust the wheel speeds and the angle of the pitching head to throw different types of pitches. Not only does this mean that you have to remember which wheels to put at which speeds and the angle the heads need to be moved to with the Hack Attack and ATEC M3, it takes more time to make those adjustments and those adjustments are blatantly obvious to the hitter as they wait for 30 seconds or more for those adjustments to be made. Simply pushing a button does that automatically with the Rawlings Pro Line 3. That, alone, should be enough to mark the Pro Line 3 as the clear winner. There are other issues with the other two machines. First, the Hack Attack weighs so much (152 pounds) that it cannot be shipped via anything but non-standard freight carriers, which leave deliveries at the curb, not at the door. It will take much longer to get it and you may not even receive any reliable tracking information on the shipment. Although it is certainly heavier than a Rawlings Pro Line 3, at least the ATEC M3 at 130 pounds can still be shipped via normal shipping companies like FedEx or UPS. The Rawlings Pro Line 3 ships via FedEx. Additionally, the ATEC M3 and Hack Attack are built as offensive hitting machines only; forget being able to use them for any kind of decent defensive drills. You also need to realize that when you change the pitch type, it obviously changes the location where the ball is going to cross the plate. The Rawlings Pro Line 3 has wheels on both the left and right to adjust the pitch height and left-right direction, something that is not achieved nearly as easily with the M3 or Hack Attack machines. The Hack Attack only throws up to 80 MPH, so it is a high school machine, at best, and doesn't even meet your needs. While the ATEC M3 leads you to believe it will throw 105 MPH, that is with both wheels at the same speed, which produces a knuckleball. I don't think anyone on the planet wants to face a 105 MPH knuckleball! The M3 and the Pro Line 3 can both realistically throw a 95 MPH fastball. Really, there is little comparison other than the fact that they all have three wheels. The Rawlings Pro Line 3 is clearly the best pitching machine of the three! Q: What are the dimensions (height, width, depth) and assembled weight of the Rawlings Pro LIne 3 Wheel Pitching Machine? Thank you. A: The weight of the pitching machine without legs is 115 pounds. If you are transporting the machine in your car with the legs removed the height is approximately 3 feet, the width is 3 feet and the depth is 16 inches. Fully assembled with the legs, the weight is 117 pounds, the height is 5' 6", the width is 3 feet and the depth is 16 inches. Q: What are the power requirements? I assume it's a 110 v plug, how many amps does it need? A: I do not know the number of amps this pitching machine requires. Most people asking this type of question are doing so because they want to know what type of generator they need for a pitching machine. The Rawlings Pro Line 3 Wheel machine operates on standard 110 volts. To operate it with a generator, the generator needs to provide AT LEAST 1,000 continuous duty watts. Q: Does the machine come with legs or do I have to order the xl legs separately? A: The Rawlings Pro Line 3 Wheel pitching machine definitely comes with legs. You select which type of legs and feeder chute from the "Machine Type" drop-down selection above the Add to Cart button. If you select regular baseball or softball legs, there is no additional cost. If you want it to have XL baseball legs in lieu of regular baseball legs, those cost $100 more. If you want it to include both regular baseball and softball legs and chutes, it costs an additional $200. If you want the machine to have XL legs, softball legs and both baseball and softball feeder chutes, it is $300 more. Q: Would the Rawlings pro line 3 breaking pitches be effective in a short cage that's 35 to 40 feet long? A: Naturally, the further away a pitching machine is from the batter, the more curve there will be on a pitch. There is only so much curve that can happen in a very short space. A 40 foot cage really means the batter is only 30-32 feet from the machine, since neither the machine nor the batter can be flush with the net. That is about half the major league regulation distance of 60.5 feet meaning the ball will only curve about half as much as it would from regulation distance. A three wheel machine is going to be the best machine for throwing sharp curves, but it would be unrealistic to expect it to curve as much from 30 feet as it would from 60 feet. One of the settings on this pitching machine is the amount of curve and you would certainly want that set to its maximum setting when trying to throw curves from such a short distance. Q: What's the slowest speed? I used it for the first time today. It doesnt go less than 35MPH? A: As the product page states, its slowest speed is 40 MPH, which is about the speed an 8 or 9 year old throws a ball. Q: I'm interested in purchasing this Rawlings pro line 3 pitching machine. If I also purchase the Loaisville slugger portable baseball screen. Will the hole on screen line up exactly where the Rawlings pitching machine throws the ball? Protecting this machine is very important to me. The Louisville Slugger Pitching Machine Screen has a 20 inch tall, 12 inch wide opening allowing for minor pitching machine alignment adjustments. The bottom of the opening is approximately 18 inches from the ground, which puts the top of the hole at 38 inches above the ground. The Rawlings Pro Line 3 Wheel pitching machine has a softball release point of 32 inches, so it would work for that. The baseball release point is at 60 inches, so it definitely will not work for baseball with this machine. Most people purchase the Cimarron Residential L-Screen. It is much better built with extremely tough #42 netting and will definitely work with this pitching machine or live pitchers. Q: My question is does this Rawlings pro line 3 wheel pitching machine come with remote control? A: The pitching machine, itself, does not have a remote control. Balls have to be fed into a pitching machine one by one, so a remote control would not do much good. The Rawlings Pro Line Automatic Ball Feeder does have a remote control that allows you to turn the feeder on or off so that the batter can get set between pitches. A Rawlings Pro Line three wheel pitching machine can throw any dimpled pitching machine baseballs, lite balls or regulation baseballs. If you are going to use regulation balls, please only use the highest quality leather balls and realize that they will not be as accurate as dimpled balls. Also know that the seams on real balls will wear your pitching machine wheels out faster and that pitching machines are known to rip the covers off of real balls - especially softballs, which have very thin covers. Really, any pitching machine balls listed on this website will work well with a Spinball Wizard pitching machine EXCEPT for Heater Leather Pitching Machine Baseballs and JUGS Pearl Leather Baseballs, both of which have a slick coating over the leather that causes gripping issues with the wheels. We don't want anyone to be unhappy with their purchase, so Rawlings Pro Line 3 Wheel pitching machines may be returned for any reason within 30 days for a full refund minus a 15% restocking fee. The 15% restocking fee is calculated from the normal sale price and not from any additional discount coupons that may have been used. This fee is the lowest in the industry and covers our outgoing shipping costs, non-refundable payment processing fees charged to us by credit card companies, processing and packaging expenses and minor cosmetic damage to the machine. It is the customer's responsibility to pay for shipping back to Spinball Sports. Pro Line 3 Wheel pitching machines are covered for 5 years for residential use or 1 year for commercial use. This warranty is prorated for the wheels, just like car tires. For example, if a wheel only lasts 3 years (60% of rated life) we will give you discount of 40% on a replacement wheel. No matter where you order a Pro Line 3 Wheel Pitching Machine from, NOBODY actually stocks them; they all ship directly from the manufacturer's warehouse located in Mt. Vernon, Illinois. Therefore, the shipping time frame is exactly the same no matter what website you order from (we hope that it is this one!). Rawlings Pro Line 3 Wheel Wizard Pitching Machines typically take 3-5 business days to ship from the time you place your order. They ship via Federal Express (FedEx) Ground and could take anywhere from a day or two to a week to get to you AFTER being shipped, depending on your proximity to their warehouse. We will notify you of your tracking number the moment we receive it from the manufacturer's warehouse. Click here to download an easy to read, printable PDF of the Rawlings Pro Line 3 Wheel Pitching Machine Owner's Manual.